When Sony announced a release date for Playstation VR a few weeks ago, I felt simultaneously excited at the potential of the platform and skeptical about what Sony would actually be able to accomplish with nothing more than a giant headset, a Playstation 4 Camera, and the PS4's relatively middling power. Can it really compete with Oculus Rift and HTC Vive? Having just tried it, I can safely say: Hell yes. Last night I had the chance to try out the new PS VR for a couple of hours, and holy wow, I can’t wait for this thing to arrive in October. The potential for greatness is apparent. There’s something very natural—very simple—about using PS VR. Golem, made by former Halo developers at Highwire Games, lets you wander the world in golems of varying sizes. It was easily the most playful demo available and the one that took the fullest advantage of the possibilities of VR. It also showed off just how good the head tracking in PS VR is. You move forward and backwards by physically leaning forward and backwards—the steeper the lean, the faster you move. The PS Camera quickly caught even the small tilt in a direction but also always knew which way I was facing. There were some issues. Controls sometimes felt jittery and you can’t move forward while looking down—mainly because it leads to nausea in a lot of players and the developers wanted to avoid building a ralph factory. The game was also the most active game I played—exhausting even. That’s because it has sword fighting, and I turn into the Star Wars kid whenever given the opportunity to do physical combat in a virtual setting. My enthusiasm combined with the alpha quirks of the demo to show off some issues that still need to be sorted out. I tended to block blows and retaliate a little faster than the game expected, and the system didn’t always register how far I’d extended my controller/sword. So I’d miss the bad guys on occasion and get a face full of steel for my trouble. 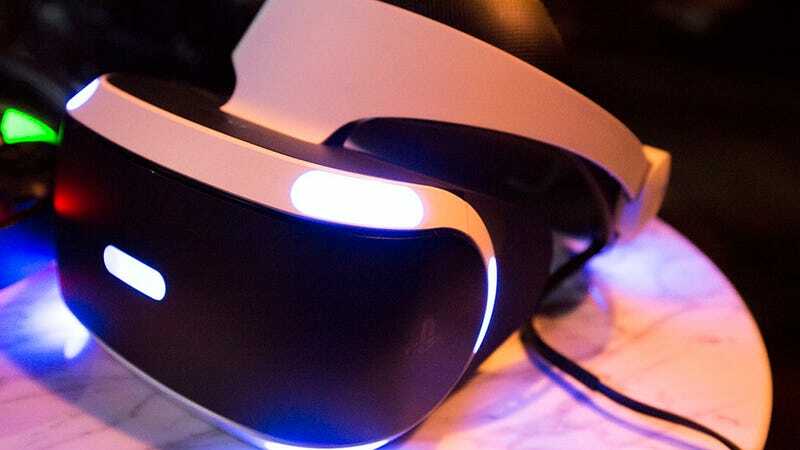 Yet as rough as the alpha version of the was, it made one thing clear: The PS VR headset itself is very close to being finalized and feels absolutely nothing like the Rift or the Vive felt at this stage of the game. First, there’s only one necessary plug needed between headset and console. Total. The Vive has an entire melange of cords and ports needed to get to gaming and the Rift requires at least a USB cord and HDMI cable (bundled together to snake out of the headset to the PC). Let’s hope PS VR continues to limit things to that one cord. And second, it’s really easy to put on and focus the headset. Both the Rift and the Vive require some adjustments to get content in focus, particularly if, like me, you’re a stunning example of human evolution and require glasses to see the world. While the Rift and Vive are more customizable than PS VR there’s something to be said for a headset that just works. I wore a lot of headsets last night and never had to do more than make sure I had each properly seated on my noggin. Focus was always smooth. The only real noticeable issue, at least at this point in development, is the sweat factor. PS VR puts a lot of rubber and pleather up against your face. Every demo I went to started with a poor developer wiping the last user’s body fluids off the device before handing it over. If that feature makes it through to launch, do not plan to show off your new headset anywhere remotely warm. Or do, I’m not your parent. Just invest in some nice gentle cleaner okay? You don’t want to break out because your nasty best friend got all his oils on you sweet new headset. After spending the last month living and breathing VR, I’m surprised at how refreshing the PS VR demo felt. There’s a polish to the experience that’s just never been there with the Rift and Vive. Though I’m still not sure how much of that has to do with the technological wizardry of the headset. The Vive was created by a mobile phone company and the Rift by a Kickstarter startup. The PS VR is being built by one of the largest consumer electronics companies in the world, and it has decades of experience, not just in gadgets, but specifically in gaming. They’re also the third major headset to the game so they’ve no doubt learned a lot from the early missteps of Oculus and HTC. So yeah, their demo was going to be a great experience. We’ll have to wait and see if the real thing can back up all that promise.